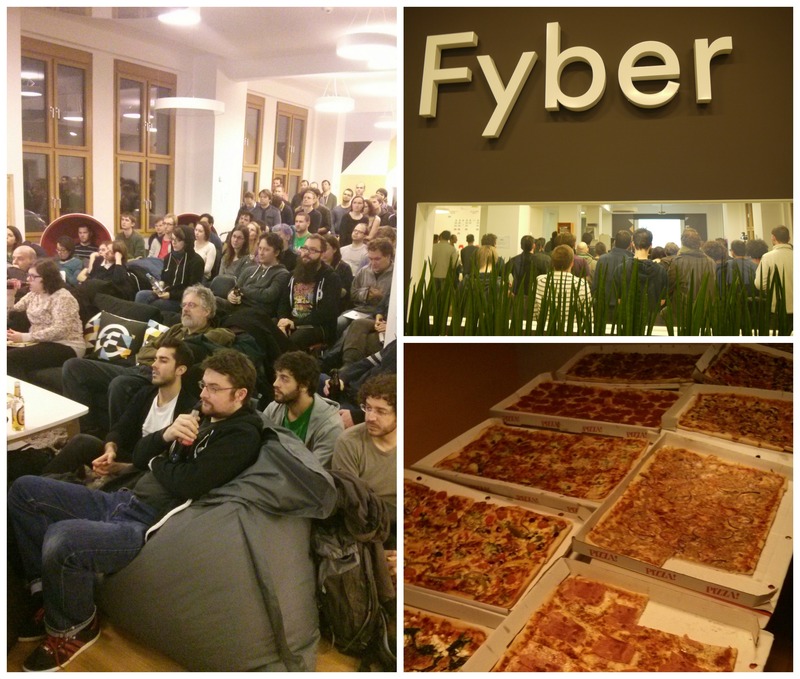 The first Ruby User Group Berlin meetup of 2015 took place on the 8th of January at Fyber. We are always happy to welcome our Ruby developer friends and aficionados but we were a tad worried that the cold weather and the heavy Berlin winter rain will deter many from attending. Who wants to endure these subzero conditions, right? Wrong! Even those Ruby devs that travelled from their Christmas holiday earlier that day, made it out for an evening of Ruby talks, beers and pizza. It was great to see a full house and some great topics to discuss. Bodo Tasche gave the guests a fantastic Introduction to Statemachines, you can find the slides to his talk here. By the way, he also does tech podcasts for bitsofberlin.org, if you haven’t checked this site out yet, do so immediately, you are missing out! Mattias Günther gave a fascinating talk entitled “Lord of the Code Smells for Padrino”, you can find the slides here. He talked about some great tools that will help you discover those deeper problems in the system and help you to avoid smells that lower the quality of your project. Very useful, specifically in the dynamic start-up scene where developers on the team change very often during your application’s lifespan. 2015 is really off to a great start, for RUG::B at least. We at Fyber absolutely can’t wait to see what other great meetups and talks they will organize this year. Join us for the next meetup at Fyber, this time we are having the Scala Group meetup on Thursday 12th of February with a talk by Mathias Doenitz on Reactive Streams & Akka HTTP. Fyber’s doors are always open to you guys! Are you looking for the perfect opportunity to join Berlin’s vibrant developer community and put your Ruby skills to the test? Fyber’s seven dedicated development teams offer the challenge you are looking for. Check out the job openings on our new careers page.